I wanted to wait until Shion 2.0 had gone live before talking about this, but since it’s now out there, it’s time to address the open source question. Some readers will remember that Shion 1.x was an open-source application distributed under the MIT license. I created Shion as part of my context-sensing research that was underway at Northwestern University. After I decided to leave academia, I knew that I wanted to make a living building and selling software products. Shion was a natural candidate, an in December 2008, I began writing Shion 2 (from scratch) using the lessons learned from Shion 1. I’ve never wanted to stop contributing to the open-source community, so I engineered Shion 2 in such a way that I can make a living and integrate more hardware selling the software, while giving developers & hobbyists an opportunity to create home automation apps & services themselves. To accomplish this, I’ve separated the Shion device communication code from the Shion GUI code as a separate reusable framework. Audacious Software will be making an official release of the Shion framework later this summer, when I have some time to refactor and document the framework source code. 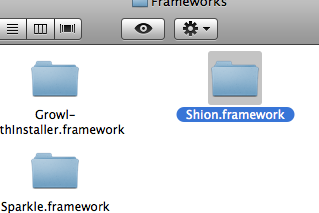 Shion.framework will be made available under the GNU General Public License 2.0. Basically, interested developers are free to use the Shion framework in their own projects under the stipulation that they distribute their own work under the same license (GPL2). 1. Encourage hobbyists and other developers to implement innovative new home automation software. 2. Collaborate with the community to improve the Shion framework in terms of robustness, performance, and device compatibility. If you’re interested in checking out the framework now (sans documentation, warts and all), please feel free to fetch it out from the Shion Google Code site. The original Shion 1.x code is there as well and remains available under the MIT license. Please don’t hesitate to post a comment or send me an e-mail if you have any questions about the framework.